The Festival encompassed nearly 500 performances, events, exhibits, talks, tours, and classes on its 220-acre campus in Becket, Massachusetts and throughout Berkshire County, engaging tens of thousands of attendees and creating countless dance experiences for audiences of all ages and backgrounds. Community Engagement is a main focus of the organization’s growth plan, Vision ‘22. A key way to measure the success of this thread is through the tracking the number of individuals that engaged with dance “off the mountain” or while not directly on the Pillow’s site in Becket, made possible through community partnerships and co-presentations. With almost 60 off-site events, nearly 2,900 individual engagements were tracked, growing off-site participation almost 85% compared to last summer. “We celebrate the success of Festival 2018 and look forward to the future as we continue to grow and develop new programs and forge new partnerships. As an organization, we have dramatically shifted our thinking beyond our summer festival to how we can serve the dance field nationally and internationally and Berkshire County at large with year-round ongoing programs and offerings. We’re excited to see how engagement with all of these communities grows,” says Director Pamela Tatge. Performances presented in the historic 600-seat Ted Shawn Theatre and the 220-seat convertible black box Doris Duke Theatre contribute to overall ticket sales, in addition to special events like Monica Bill Barnes’ Happy Hour presented in Sommers Studio and the All Styles Dance Battle; in each theater, a minimum of six weekly performances are presented that represent a diversity of dance genres from around the nation and world. The highest-selling performance weeks of the season include Hubbard Street Dance Chicago, Dorrance Dance, and Pilobolus in the Ted Shawn Theatre as well as ODC/Dance, Sonya Tayeh, and PHILADANCO! in the Doris Duke Theatre. Ticketed performances account for only a portion of the Festival’s summer programming. Free performances are offered Wednesday through Saturday on the Inside/Out stage. 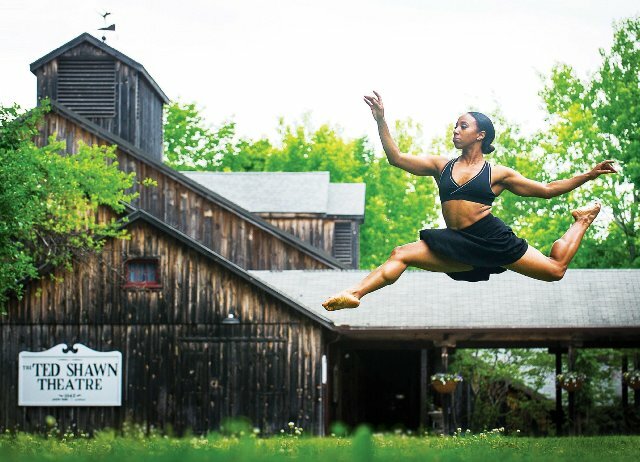 Jacob’s Pillow reports an estimated attendance at the beloved outdoor performance series of just under 19,000 individuals, a 16% decrease from 2017, predominantly explained by the area’s high number of rainy days. The Pillow was able to double the number of seating options available for patrons during indoor performances on rainy days by moving performances into the Perles Family Studio, a state-of-the-art studio and flexible performance space which opened at the end of August 2017. Beyond performance, the Pillow extended its influence and resources throughout Berkshire County by hosting and co-presenting several pop-up performances, exhibits, and workshops, and by providing technical performance support to local dance organizations performing in its Dance Zone at Pittsfield’s Third Thursday street festivals. Examples include pop-up performances in downtown Great Barrington, at the Clark Art Museum in Williamstown, and on North Street in Pittsfield; a collaborative exhibition with the Williams College Museum of Art; and movement workshops offered in Pittsfield, Williamstown, and Housatonic. Other notable aspects of the season include a new dining partnership with local Berkshire business The Old Inn on the Green and The Southfield Store. Additionally, the Pillow made strides in the efforts of its year-long Community Engagement program Pittsfield Moves!, which was conceived with lead partner The Berkshire Bridges — Working Cities Pittsfield Initiative to support local stakeholders develop a practice of storytelling and relationship-building through movement. As a result, a group of 40 participants from around Berkshire County consistently organized over the course of two weeks to premiere a work-in-progress performance on the Inside/Out stage and at Berkshire NAACP’s 45th annual Gather-In Festival in Pittsfield. In the 2018 Fall/Winter season, Jacob’s Pillow continues long-lasting programs and strengthens new programs, many of which are ongoing from September through May. In its second season, the Pillow hosts residencies through its newly launched incubator of new work, the Pillow Lab. 2018-19 Pillow Lab Residency artists include Bryan Arias, Adam Weinert, Reggie Wilson/Fist and Heel Performance Group, Kyle Abraham’s A.I.M., Jacob’s Pillow Curriculum in Motion® (JPCiM) Artists Educators, Liz Lerman, Faye Driscoll, Jean Butler Dance, Souleymane Badolo, Anne Plamondon, and Australian Dance Theatre. Additional highlights include a social dance party in partnership with Berkshire Salsa as part of the new Pillow Party Series; the continuation of the nationally-recognized curricular program in public schools Jacob’s Pillow Curriculum in Motion®; a new collaboration with Dance Education Lab (DEL); and the hosting of convenings for the dance field at large. An overview of ongoing programs and events are included below. Please note, not all events are open to the public. Visit jacobspillow.org for more information. Angela’s Pulse completed their final long-term residency in Pittsfield from September 15-23 with a culminating performance at the Harvest of Hope Festival, a multicultural, community- building festival in Pittsfield. Particularly this fall, outgrowths of this work will be woven into locally generated events, seeding possibilities for future visioning and organizing. Throughout October and November, members of Angela’s Pulse will return for shorter visits that include Understanding & Undoing Racism training and to continue the final strategizing with the Pittsfield Moves! group, which includes artists and individuals from around Berkshire County. The engagement program—which has been developed over the course of one year and taken shape through multiple community residencies shepherded by New York city-based collaborative Angela’s Pulse—is rooted in creative and organizing practices that are process oriented, collaboration based, community centered, anti-racist, and embodied. Key Berkshire County community partners throughout this initiative include Working Cities, Youth Alive!, NAACP Berkshire County Branch, Manos Unidas Multicultural Education Cooperative, Railroad Street Youth Project, Berkshire Children & Families, and Transformative Development Initiative, among others. JPCiM is a nationally recognized, arts-integrated curricular approach that connects Berkshire County K-12 students, classroom teachers, and administrators to kinesthetic learning. Each residency is co-taught by prominent Jacob’s Pillow Artist Educators in collaboration with classroom teachers to foster new ways of academic learning, social interaction, and creative thinking by linking choreography, kinesthetic intelligence, and critical and imaginative thinking to academic learning subjects. Participating schools include Monument Mountain Regional High School in Great Barrington, Conte Elementary School in Pittsfield, and Becket/Washington School in Becket. New this year, Jacob’s Pillow collaborates with the Dance Education Laboratory (DEL) and becomes a New England satellite of the nationally renowned dance teacher education program. Founded by Jody Gottfried Arnhold and designed to serve as a practical alternative to traditional university dance education programs, DEL addresses the needs of professional dancers, dance teachers, classroom teachers, and dance students. Led by DEL Founding Faculty Ann Biddle and assisted by DEL Facilitator Felice Santorelli, Jacob’s Pillow hosts several workshops throughout fall, including DEL Mini Workshops and weekend-long DEL Essentials Workshops, both providing integral training for dance educators at any point in their career. This new collaboration introduces dance educators, college dance students, and classroom teachers to the DEL model of dance education—situated alongside the resources that Jacob’s Pillow offers as a year-round center for dance research and development, including state-of-the-art studio spaces, unparalleled dance Archives, In Process Series showings as a part of Pillow Lab artist residencies, housing, and a retreat-like atmosphere. The DEL Essentials Workshop is a three-day workshop that includes 20 workshop hours in addition to Pillow activities. DEL Mini Workshops include two workshop hours. December 1 also includes access to the In Process Series at the Pillow Lab. The Jacob’s Pillow College Partnership Program exists regionally, nationally, and internationally to elevate dance as a means of research, discourse, and artistic expression for faculty, artists, scholars, and students working within higher education. College students and educators are invited to use the Pillow’s resources year-round and engage in the artistic process by attending In Process Series showings at the Pillow Lab and finding support for their academic research in the Archives. This day-long convening of colleagues strives to generate necessary dialogue that reflects and expands upon the existing College Partnership Program. Current College Partners include Boston Conservatory at Berklee Contemporary Dance Program, Dartmouth College, Massachusetts College of Liberal Arts, Springfield College, University of Massachusetts Dance Program, and Williams College Dance Department, among others. Urban Bush Women (UBW) will host a convening for dramaturges and scholars to discuss and share methodologies around dramaturgical practice in dance and support for work exploring complex narratives that address culture, identity, and history. Jacob’s Pillow Scholars-in-Residence will give pre-show talks tailored to each Bolshoi Ballet HD broadcast, modeled after the pre-show talks presented at Jacob’s Pillow prior to each Festival performance. Jacob’s Pillow Scholars-in-Residence are comprised of today’s leading dance and performance journalists, scholars, and lecturers. Now in its final weeks, this unprecedented exhibition includes costumes, photograph, props, set pieces, and other artifacts documenting the dawn of American modern dance, drawn from the extensive Jacob’s Pillow Archives. Brand-new content from the 2018 season as well as recently-digitized dance excerpts from the Pillow’s Archives are available in this ever-expanding online collection.